Fiber folk: I first got to know Jaime and Amber via Instagram and later on in person when they were visiting the Bay Area. 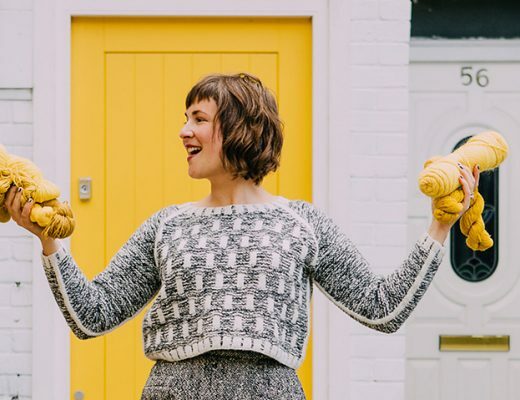 These two incredibly creative and inspiring women are just as sweet and hilarious in person as you can imagine, but what’s even greater is how their journeys crossed paths and later joined to create the amazing store we know as Fancy Tiger Crafts. Their passion for handmade wardrobes, teaching and creating community is evident in every facet of what they do. You can find Jaime and Amber at fancytigercrafts.com and on Instagram @fancytigercrafts, @fancyjaime and @fancyamber. Man on the street: For this week’s “Man on the Street” I asked the question, “How do the warmer Summer months affect your fiber habits?”. We had some great answers from Jennifer @jay_kay_knits, Kerry @kerryrobb, Sonja @atreebytheriver and Melissa @hey_lady_hey. Giveaway: The winner of last week’s giveaway, is Sarah! 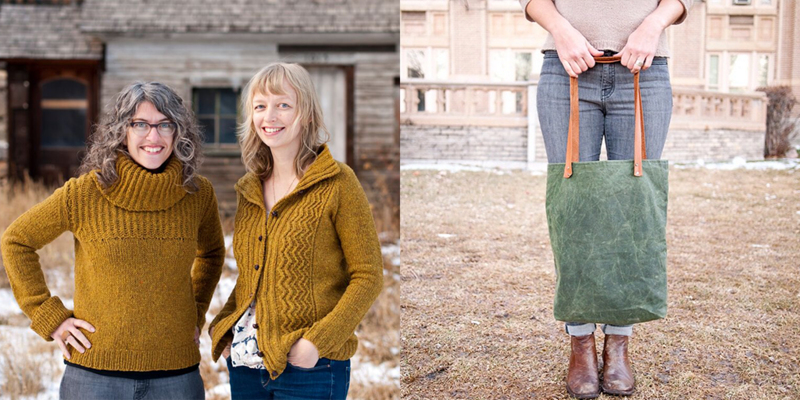 You’ve won 2 skeins of Woolfolk Tynd and the Fure Armwarmers pattern from Knit Purl. Congratulations! 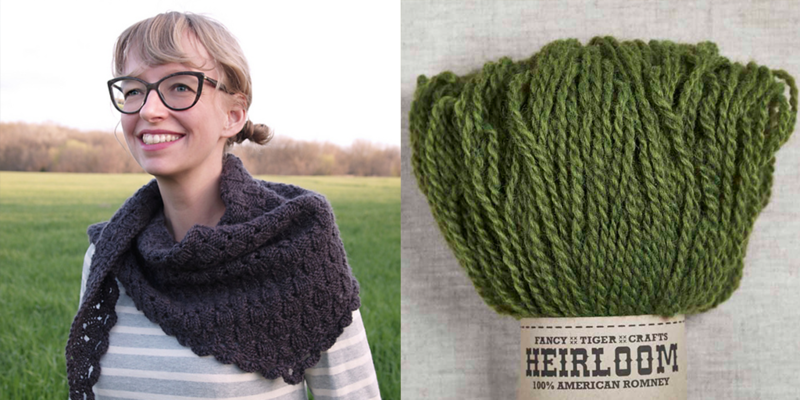 This week’s giveaway is sponsored by Fancy Tiger Crafts and we’re giving away two skeins of their Heirloom Romney yarn in the color of your choice, along with their beautiful Imposter’s Shawl pattern. To enter this giveaway, leave a comment in the comment section at the bottom of the post page. Amazing podcast! Such a great story of fancy tiger crafts! i’ve been following Jamie and Amber on Instangram for a few months now, adorable ladies and the work that they do! Yay!!!! It’s Tuesday!!!! Thanks for being something that I eagerly await every week!!! I’m very excited about this episode- I’m a huge fan of Fancy Tiger. Love these guys! One of my favorite podcasts. 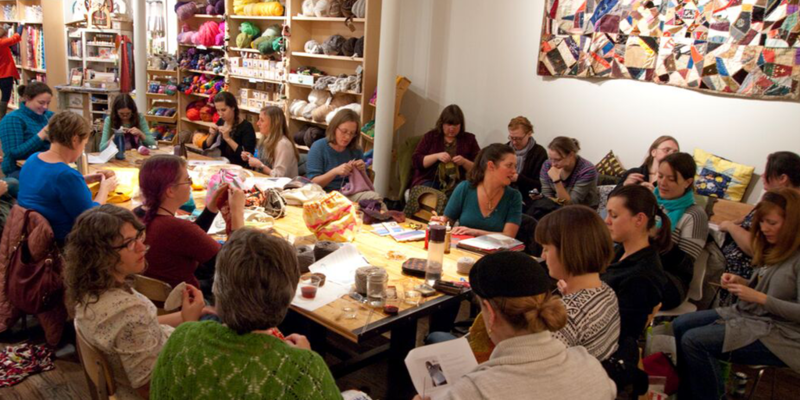 I wish I lived in Denver so I could attend their Tuesday craft night! Woolful offers the best knit/fiber-related podcast that I’ve come across by far. I love everything about it, and I’ve been binge-listening lately. Thank you for making it available. I’d love to try the wool, and I’d love to visit the shop! What a delight to hear these two women interviewed. I’ll be in Denver next spring and can’t wait to see Fancy Tiger (and maybe take a class!) in person. Thanks again Ashley, love the Fancy Tiger on-line store and their blog. Will definitely visit the shop the next time I’m in Denver. I wish I lived closer to Denver so I could visit fancy tiger crafts. It seems like such a lovely store! Would love to try out a new yarn. What a great interview!! Thanks for such a wonderful giveaway. Love your podcast! I discovered it about a month ago and have been binge listening ever since. I’m now caught up and look forward to each new episode. I’m so inspired by all the wonderful artists in this community. I want to try all the yarns and knit all the patterns. Thank you for sharing! I just found and fell in love with your heirloom Romney at the Knitting Tree festival booth at TKGA 2013 CONVENTION IN SAN DIEGO. I couldn’t stop smelling the farmy yarn and musing at the luster of this wool. I’m grateful to Woolful for educating me about sustainable processes and fibers, it’s inspired me to be a more thoughtful knitter. Can’t wait to knit with my four hanks of FT Romney that I purchased! I enjoyed listening to this week’s podcast and learning more about Jaime and Amber. Thanks as always for a great podcast. I love the Heirloom yarn! Thanks for another great listen! I haven’t been around long, maybe a Month or a bit more, but I think I’m catching on to Who’s, who and What’s What! You have know idea how exciting that is for me. Each time the news letter pops into my mailbox, I take a deep breath and hope there are NO INTERRUPTIONS! That just wouldn’t do, when you about to Read a (hopefully) long line from Friends. I always want to spend Money, good for my Friends, not so good for me! But I bet, No one can Blame me and that they feel the very same way. I have a favor to ask, do Ya’ll think Ya could put what the item is on the pictures? I know it’s probably a fiddly thing, but I always find something I Love and Try to Find it. just the Basic Pattern, not the colours. And, of course speaking of, I believe it’s the 4th picture down on the right(my right, of course). It is a Beautiful Sweater, worked with a colourful Yolk. It’s my Fav. this go round! I’m getting into the Winter Frame of Mind! If anyone has any hints or musts that I might have missed, being a “Newbie”, please let me know! I want to make sure I get every wonderful bit out of this “Fancy Tiger” and would feel very “Woolful” if I miss something! So excited to learn about fancy tiger. And huzzah for breed specific wools! What a lovely podcast! I just found you on IG and was so happy to hear a story about one of my favorite craft shops. I made many projects from their beautiful materials when I lived in Denver and I’m so glad to hear that they have an online shop so I can continue to do so. Fancy Tiger Crafts is one of my favorite online stores! So great to hear about their background. Another great podcast. Keep ’em coming! I look forward to listening to them. I visited fancy tiger with my sister years ago before they moved to their new location. It was magical then, and the new space looks even more amazing. What a fun interview. I’d love to experience Heirloom! Thanks again for another lovely episode! I really enjoyed this episode. 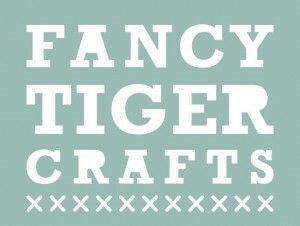 I dream of visiting Fancy Tiger in person someday, but in the meantime I’m happy for their online shop, classes, etc. Another lovely podcast. Will have to visit Fancy Tiger Crafts’ website since I don’t live close enough to visit. Thanks for your hard work putting together these interviews, each of which expand our horizons. Beautiful wool and beautiful Shawl! Loved listening to these two’s story! And glad their paths crossed to create Fancy Tiger Crafts! I love the connections you make throughout the fiber community. Imagine the delight to be able to walk my happy dog Cooper and listen along with you and your friends…the perfect way to start my day. thanks. What a beautiful shawl pattern in the giveaway this week. I’ve been itching to get my hands on some Romney since I’ve never tried it before. Can’t wait to listen to the podcast! What a great episode! Now I want to move to Denver! Maybe I can go visit Fancy Tiger sometime. I loved hearing their story, and how their paths crossed, uncrossed, almost crossed, and crossed again. Fancy Tiger is the best! 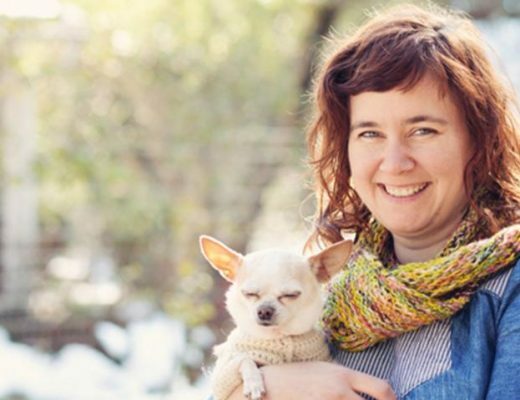 I learned a lot from the Yarn 101 class on Creative Bug and then to hear this interview with Jaime and Amber was a real treat. This is a great podcast and I look forward to every episode! I really appreciated the insight that a place like FTC could not just pop into existence, or be opened today as it is. Hearing that it took time, and many re-imaginings and much work to evolve into its current form is a great reminder and inspiration to those of us just starting out. I have been reading the Fancy Tiger blog forever and have ordered off their website. They have an amazing amount of energy and love for what they do. 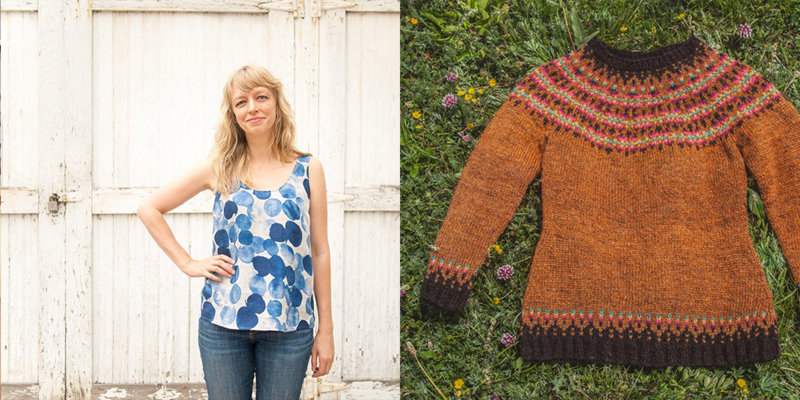 What gorgeous yarn, pattern and pictures! Can’t wait to listen to the podcast! This community… incredible. isn’t it? These two ladies are awesome, I love visiting their shop. It was super fun to hear their stories and how their crafting fates collided! I loved listening to the podcast- I have been following Fancy Tiger from afar for several years now and really love their style and enthusiasm. Thanks for this! can’t wait to listen to this episode – I love the fancy tiger girls! Every episode I find myself saying “this is my favorite interview”. Well, today I can say it and mean it! I feel like booking a trip to Denver RIGHT. NOW. Someday soon I hope I can visit Fancy Tiger & meet these two wonderful ladies. Loved this episode! I’m a big fan of Fancy TIger Crafts and order from them all the time. Their Sailor Top is one of my favorites to sew and wear. I hope to be able to visit the shop someday. I found Fancy Tigers through Ysolda’s blog because of a knitting tour to Iceland. Great work! I wouls so love to visit that cute store, too bad I live so far away (Montreal), someday maybe…! Lovely yarn and shawl pattern! I loved this podcast…thanks keeping them coming! Loved the podcast! I am actually going to Denver in October on a business trip and I hope I will have time to visit Fancy Tiger! What a wonderful interview. Very much enjoy following the Fancy Tiger blog and hope to see it in person some day in my travels. Your podcast is simply lovely. Thank you. I loved listening to these beautiful ladies stories. Loved the podcast as usual. It’s nice to have one that’s audio I can listen to while I knit. Thank you.. Sometimes I think there would be no lovelier way to have a life in fibre than to own a yarn/fabric shop. But, as we’ve learned from the podcast, there’s so much these shop owners give to making their businesses what they are. And there are so many myriad ways to have a life in fibre. 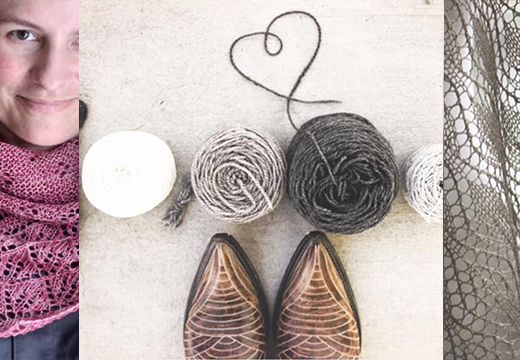 I’d love the opportunity to work with the beautiful Heirloom yarn! Loved hearing this story. Fancy Tiger is pretty much responsible for my current knitting obsession as they introduced me to quality wool. Excellent interview! I’ve been following Jamie and Amber on instagram for some time (and stalking their ravelry when I’m in need of knitting inspiration! ), and it is so lovely to get to hear them speak. Their shop is definitely on my list of places to visit. The Heirloom Romney looks so soft and squishy. I’d love to get lucky. I love the new shorter format since I can listen in one sitting. Was listening to this week’s podcast while knitting to yarn that I bought from Fancy Tiger and catching up on a cowl class that u am taking there. So awesome to hear their journey. Thank you for interviewing them. I love hearing about fibre travel. 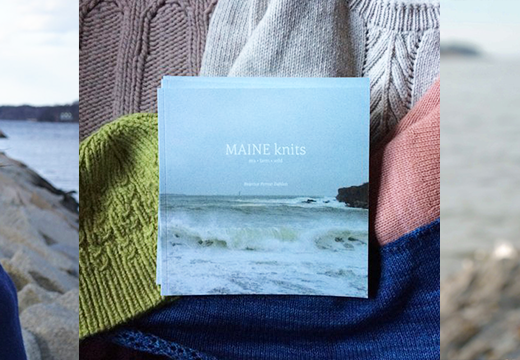 Thanks for the chance to win some lovely Made in the USA yarn. Have just discovered your lovely podcast from Germany. It is the perfect summer break listening while knitting, organizing my stash or practicing my newest skill, spinning. Amazing, as usual! So awesome to hear the story of 2 great friends. 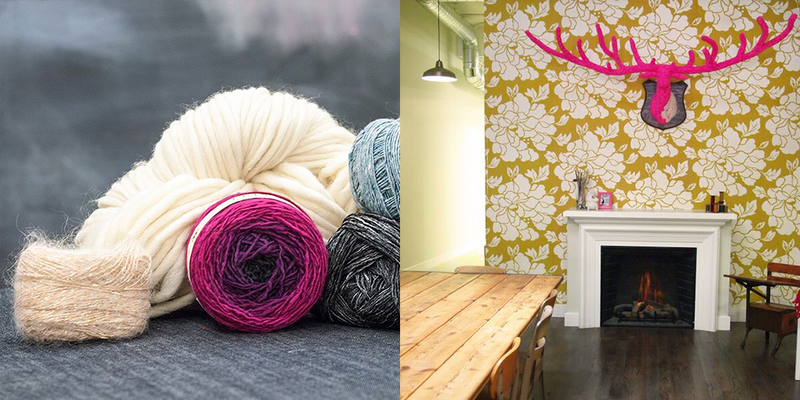 Can’t wait to try their Heirloom yarn. I’ll definitely visit there next time I’m in Denver. Thanks again for a wonderful podcast. Will hope to get to Denver and visit Fancy Tiger someday. Love fancy tiger’s blog! So inspiring. And thanks for another fantastic podcast! I just found your podcast – today I listened to Episode 30 & 31. I love it … will continue listening!!! Thanks for all your hard work to produce the podcasts plus your guests!!! My knitting does not change in he warmer months. Since I’m usually in air-conditioned rooms, I knit what I want when I want. Fancy Tiger Crafts is on my list of places to visit when I’m back in my home state! What a wonderful podcast! I am enjoying your work! I know where I’m going the next time I get to Colorado! I’ve just been knitting with some locally sourced (Arizona) Romney and was thinking I’d like to try more. Thanks for another fascinating episode. I enjoy following Fancy Tiger on Instagram and have even purchased yarn from them online. It was great hearing their story. I hope to visit their store in person one day! Thank you for producing your podcast. Another great episode! Loved this episode. Fancy Tiger is one of my favorite shops! I was excited to listen to it to learn more about how it started. That looks so woolly and slightly vintage chic! I’ve never knit with Romney, and I’d love to try. Love fancy tigercrafts!! Delightful podcast! Thank you!!! I love Woolful and Fancy Tiger Crafts! The Romney breed was introduced to me by your podcast. My favourite colour is the blue maize. This is my first time listening to your podcast! This episode was an excellent way to start as I had a chance to visit Fancy Tiger while I was travelling to Denver in May. The store is really lovely. My friend and I both picked up yarn and we spent our return flights happily knitting/crocheting new projects. Thank you Ashley,for another wonderful episode.I have been hearing so much about fancy tiger crafts,what an awesome shop. I would love to get the chance to knit that shawl,it looks cozy! Love the beautiful colors and the specially selected heirloom wool. Another great podcast, wish I lived closer to Denver.. I love hearing these stories of fiber journies, thank you so much for these podcasts! Wonderful podcast! I’ve ordered from Fancy Tiger several times but haven’t yet been to Denver since I discovered them. Hoping to correct that soon! Jaime and Amber’s idea for tiger yarn made me laugh out loud on my morning subway commute. I got some weird looks, but that idea is pure class! So creative. I’m rooting for you gals and will be shopping online until I make it to Denver. And thanks Ashley for always finding the most interesting people to interview. Thank you for this interview! I look forward to the day when I can visit Fancy Tiger Crafts in person. Enjoying your podcast. Thanks for the giveaways! Lovely episode this week, as usual! 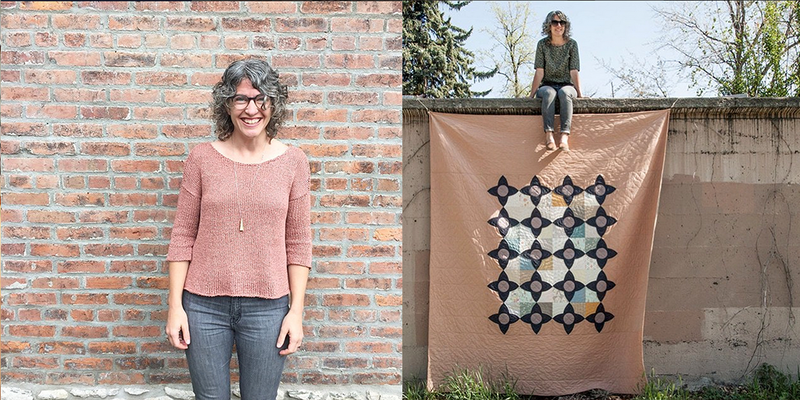 I always love seeing these ladies’ projects…they’re so inspiring. And I would love to try their Heirloom Romney yarn. I enjoy the wool education we all receive from your podcasts. My favourite colour is the blue maize. Thank you for the podcast. More yarn to drool over. Fancy Tiger Crafts make a nice resource for yummy yarn. Thank you so much for another great podcast! Always inspiring. Another great podcast! And very timely and relevant. 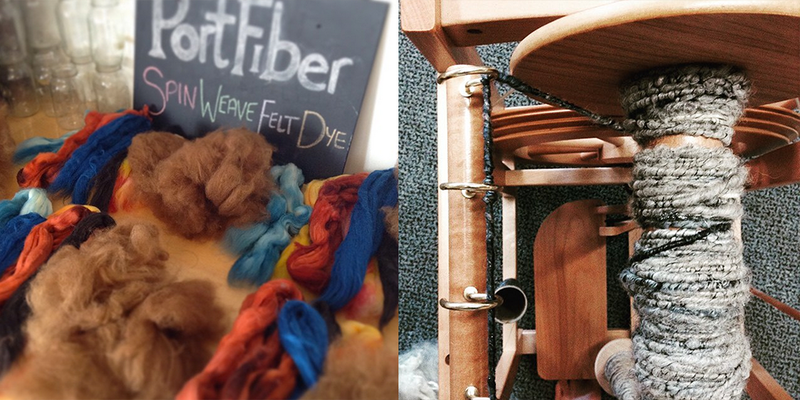 I’ve been noodling the idea of opening a fibershop, so Jaime’s and Amber’s story, experience, and advice was very timely and pertinent! Thanks again for introducing us to more wonderful fiber folk from all backgrounds, experiences, and trades in the fiber industry! Enjoy your informative and interesting podcast. Thanks! Loved this weeks podcast! I’ll have to visit the shop next time i’m in Denver! And … I’m wondering … am I *that* Sarah?!?! I love Woolful & am always inspired anew by your guests. With each podcast I feel like I’m living Hansel & Gretel following the trail of crumbs you leave for me to explore new creative resources… Thank you! Just found your website and really enjoying the podcasts. I’m based in Portugal where there is no real knitting community, so it’s great to feel involved. Loved the episode – I want to go on some of the amazing holidays mentioned! Loved the podcast! Thanks for the offer! I loved this interview! Total craft crushes on Jamie and Amber. I was giggling out loud over the story of trying to get tiger fiber to spin! I love this podcast and that Heirloom yarn looks amazing! I love these podcasts…I’m always learning about shops or yarns I never knew. Romney if one of my old time favorite breeds, and I’d love to try Heirloom. Great colors, too! Yay! Fancy tigers! I so enjoy following their many craft adventures. They are such an inspiration. I dream of one day visiting Denver, just to visit their shop. 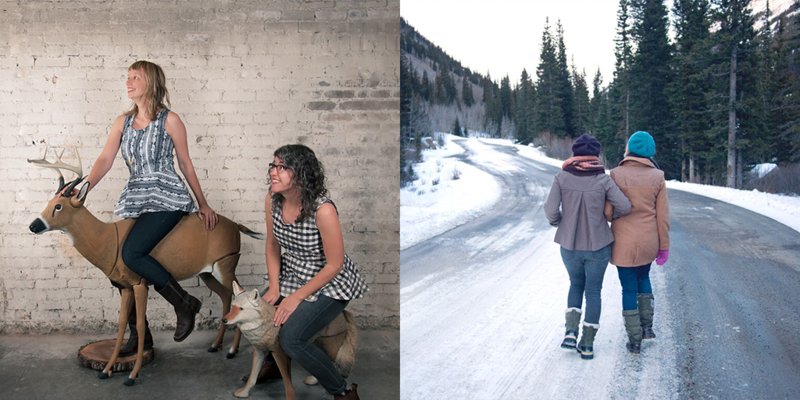 I love north of Denver and need to get down to visit them soon. Sounds like such a neat place! I would love to try this yarn. Your blog and podcast are so interesting. I learn about some very creative people from you and I love the photos you take. I love Jamie and Amber and have been following them on IG for a while. It was great to hear their voices and learn more about them. Loved listening to their fibre journey, it was lovely to hear how ambitious they are – i’m sure many people listening wish they had the guts to do similar, myself included. The stories about travelling to Iceland and trips to farms to learn about their heirloom wool was particularly interesting. loved listening! I really enjoyed hearing the background of Fancy Tiger Crafts. Thanks for another opportunity to win some yarny goodness. 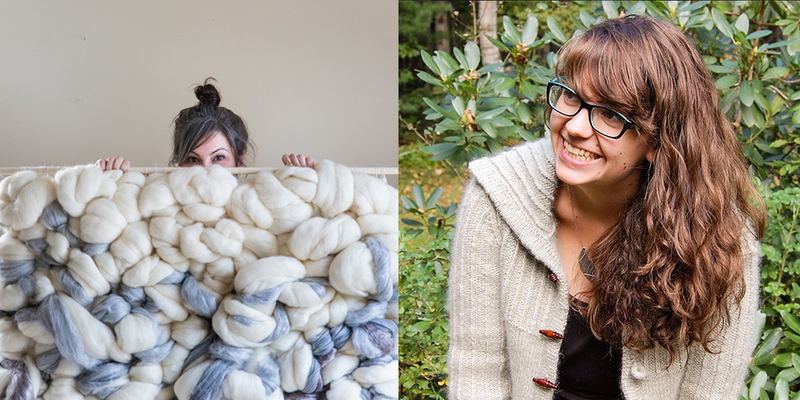 I would love to try heirloom yarn…another wonderful podcast! I’d love to visit Fancy Tiger Crafts. Maybe one day. This was such an inspiring podcast as always! I love learning about new fiber artists and their journeys to how they got to where they are in their fiber world. I can’t wait to visit Fancy Tiger Crafts some day and see it in person. I was at the Michigan Fiber Festival this weekend getting my fiber fix and I tried to tell every vendor I met about your podcast! It’s amazing how many out there aren’t aware of it!!! I guess they are too busy tending their flocks, shearing their animals, and dying wool, for me to spin and knit! I’m an obsessive knitter too! Love this website and the inspiring pics! I love the Fancy Tiger blog, it was really great to hear their story! Looking forward to giving this a listen!! Can’t wait to stop in Fancy Tiger on my way through Denver next week! I loved listening to this episode so much–thank you!! I had never heard of Fancy Tiger Crafts and was glad to hear about the store, how it got started, and then of course I visited the online shop. Thanks! I loved hearing about all their knitting trips! Makes me feel some knitty wanderlust. lovely episode, lovely ladies, lovely yarn! Yay! You interview all the best people, so much fun! I just discovered this podcast and it is wonderful. I enjoyed listening to Jaime and Amber’s journey. It seems they were destined to meet! I am looking forward to listening to all the Woolful podcasts from episode 1 onward. Thanks for providing such amazing and interesting interviews Ashley. I just wanted to say how much I enjoy this podcast. I am currently working through all the back-catalogue and I am finding all your episodes very inspiring and encouraging. Such fun! Loved this episode! Love ALL episodes! 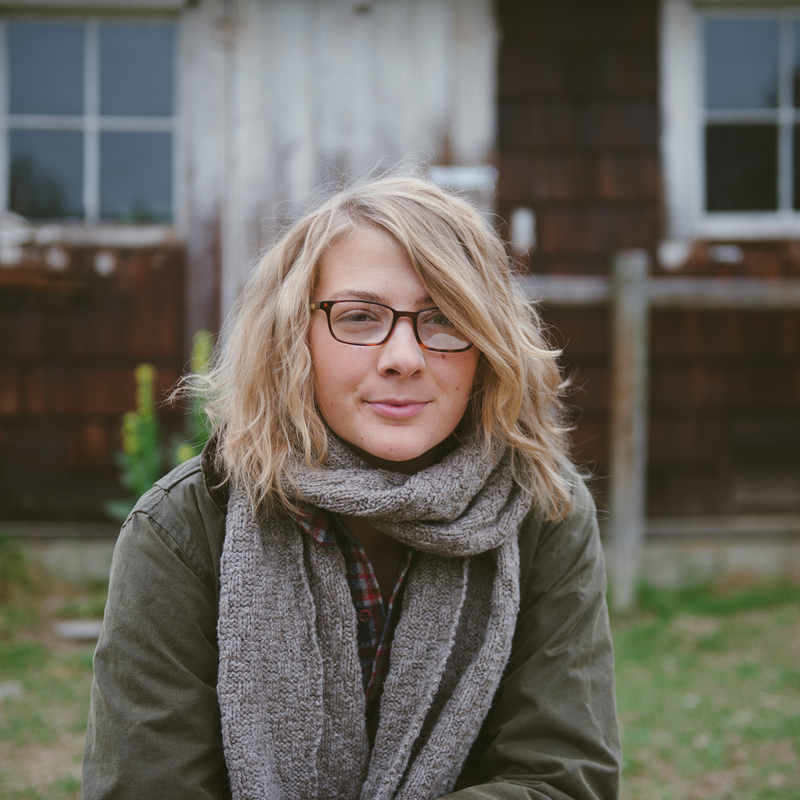 Just getting into this podcast thing – so fun!! Another new yarn (to me) to experiment with – such bounty! Love listening to the podcast. It would be super to visit Fancy Tiger, but in the meantime I enjoyed the interview on the podcast. Thanks! And thanks for entering me in the giveaway drawing. This was my first time listening to your lovely podcast, and now I’m hooked! 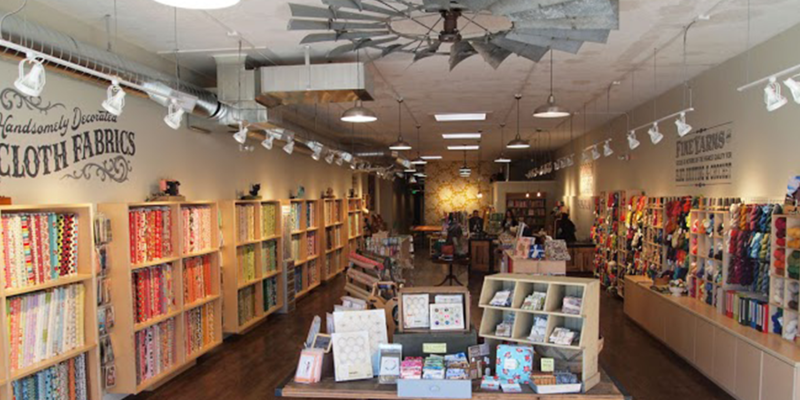 It was great to hear about the Fancy Tiger Crafts backstory after hearing so much about how cool the store is. I really enjoyed listening to the ladies talk about their journeys so far. It was really great to hear more about Fancy Tiger Crafts and their origins. 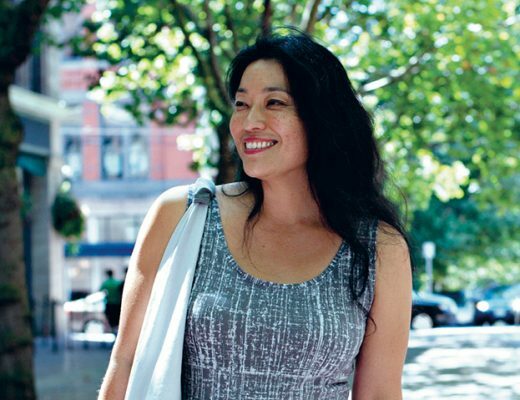 Really interesting interview, and I’m adding them to my list of yarn shops to visit one day. Like many, I am particularly intrigued by breed-specific yarns, and excited to see the support they are receiving. I am finally caught up on your podcast, so this is the first time I’ve been able to enter the contest. I have to say I really appreciate the podcasts, they make my commute so much more interesting! I love this podcast! It brings me further into the fiber world in new ways!! Fabulous episode! Thanks for the chance to win this special yarn. Fascinating to hear more about this book. Want to meet it in person someday soon. The yarn looks lovely. I always enjoy trying a new to me yarn. I may be too late to join the giveaway. It’s hard to keep up with the longer podcasts. Thanks. Savannagal on Rav. I absolutely loved this episode. Some people really inspire me and Cecelia had such insight about how stitch patterns and math interset. I had seen the book before but was in a rush and didn’t get to open it and read. I will definitely look for the book, it appeals to my nerdy self and I think would be an invaluable experience for me trying to play with different patterns. What a great giveaway! I’m in love with that hat pattern! !